When my husband was still my boyfriend and we celebrated our first Christmas together, I decided we’d make holiday cookies for our family and friends. I had this notion of these boxes becoming our tradition, as traditions were new to us as a collective whole, and in those romantic early days you have such ambition. I sought out a collection of matching tins. We wrote tags, and baked for days, and then delivered the boxes for days more. The cookie selections were a festive cacophony of flavour and texture – festooned with silver dragées, glittering gold leaf, swirls of royal icing on some, shimmering sugar on others, white and dark chocolate, all shapes, sizes, some with a nip of booze, others fruited or shaggy with nuts. We filled the boxes with every ounce of holiday magic we could muster. As often with such ambitious endeavours, the efforts waned. Our sons came along and the boxes went on hiatus. Then, they became simple tins of toffee or peanut brittle since big-batch baking was all I could handle. Another year, it was fudge, for much the same reason. Or apple cider caramels laced with heady spice. There was a period of peppermint bark, made crackling and crunchy with smashed pinwheel candies. When the boys were old enough to help in the kitchen, we returned to cookies. Not because I had an excess of time on my hands, but because of their belief – hewn of festive books and animated specials – that Christmas is a cookie holiday. At their request we made oversized sugar cookie snowflakes for Santa one year, and gingerbread the next. Lately, Santa gets chocolate chip cookies or peanut butter ones. The cookie boxes have returned, but slightly more humble than before. Two, maybe three treats inside; a bar cookie, perhaps a molasses crinkle and then a candy (specifically a sack of homemade marshmallows). This year, I thought to combine cookie and fluff, for a kiss akin to a Mallomar, but like German Schokokuss, they lean further to the marshmallow side of the partnership. Enrobed in strawberry coating, the pale pink of mine evoke a frosty seasonal cheer, especially when sprinkles are involved. The interior is pristinely snow-white beauty, scented with rosewater and vanilla, while threads of coconut add textural interest to a wheaten, graham-cracker-ish base. It’s a creamy delight, worthy of a Sugarplum Fairy or your cookie box. For the candy coating, I prefer Valrhona’s Strawberry Inspiration – it’s not actually chocolate as it has no cocoa solids. Callebaut makes a raspberry version. But the flavour of the cookies can be easily varied: Try a dark chocolate coating, with peppermint extract instead of rosewater in the marshmallow, and omit the coconut from the cookie. Or, use orange in the marshmallow and candied ginger in the cookie, with milk or white chocolate on the outside. The recipe doubles nicely. And do have a candy thermometer on hand. Start with the cookie dough. In a medium bowl, whisk together the flours, shredded coconut, baking soda and salt. Set aside. In the bowl of a stand mixer with the paddle attached, cream the butter, honey and brown sugar on medium-high until lightened and fluffy, 3 to 5 minutes, scraping down the bowl and beaters twice. Beat in the vanilla paste. With the machine set to low, stir in the dry ingredients until combined. Stir the dough by hand to make sure no dry ingredients linger at the bottom of the bowl. Refrigerate for 30 minutes. Preheat oven to 350 F. Line a heavy rimmed baking sheet with parchment paper. Turn the dough out onto a lightly floured work surface. Roll dough to a 1/4-inch thickness. If it feels at all soft, transfer to the prepared baking sheet and pop back into the fridge to firm up. Use a 1 1/2-inch circle cutter to make 24 rounds and arrange on the baking sheet. Bake until golden and firm, 13 to 15 minutes, then transfer to a cooling rack. To make the marshmallow topping, sprinkle the gelatin over the water in a small bowl. Let bloom for 5 minutes. Meanwhile, combine the egg whites, sugar and corn syrup in the bowl of a stand mixer and set over a bain-marie. Whisk gently until smooth and the sugar dissolves, reaching 185 F. Attach bowl to stand mixer with the whip attached. Scrape in the bloomed gelatin and salt. Beat the contents of the bowl on medium-high until the mixture is thick, glossy, and the bowl is warm to the touch, about 7 minutes. Beat in the vanilla and rosewater, then transfer marshmallow to a piping bag fitted with a large plain tip. Pipe mounds of marshmallow onto the cooled cookies. If desired, use an offset spatula or the back of a spoon to create swirls. Leave at room temperature, uncovered, until firm, about 1 hour. For the coating, melt the strawberry candy and coconut oil over a bain-marie, stirring regularly. Once melted, remove from heat. Pour into liquid measuring cup or similar, so that the coating is deep enough to dunk the marshmallow without hitting the bottom of the container. Dip the cookies, then set on a cooling rack set over a baking tray to catch drips. Alternatively, spoon the coating over the cookies. 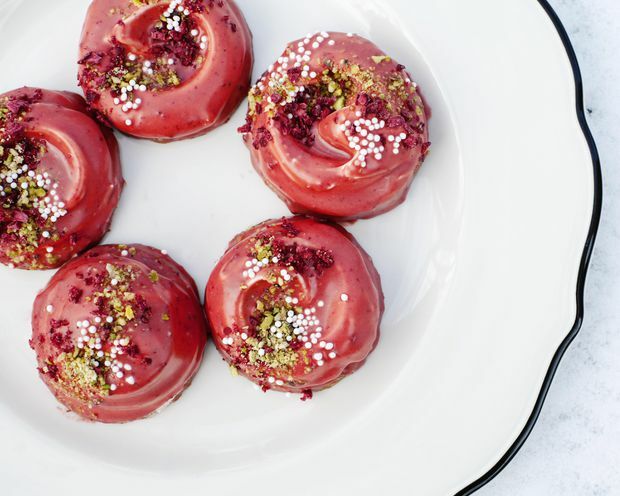 After about a minute, adorn with sprinkles, berry powders or ground pistachios as desired. Let set in fridge, uncovered. Any leftover coating can be covered and refrigerated, then used as a topping for ice cream; rewarm as needed.